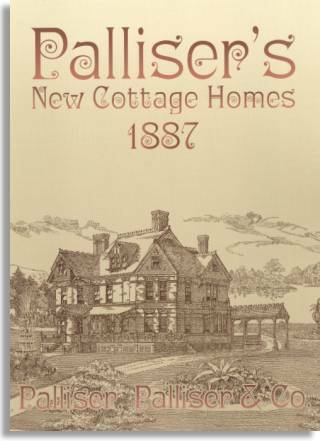 Unabridged Dover (2003) republication of Palliser's New Cottage Homes & Details , originally published by Palliser, Palliser & Co., New York, 1887. 1500 black-and-white illustrations. 160pp. 9/375 x 12.25 inches. Paperbound. ISBN 0-486-42816-8. In 1887, he New York architectural firm of Palliser, Palliser & Company issued a catalog of 250 original designs for cottages, villas, farmhouses, seashore residences, summer and winter resorts, block houses, barns, stables, and carriage houses. This volume meticulously reproduces that now-rare publication. Some 1,500 detailed drawings — among them plans elevations and perspective views — are included in this practical book intended for use by “architects, builders, carpenters, and all who are interested in the subject of building … or the improvement of wood, stone or brick [structures].” Depicted are residences ranging from a four-room beach house to a four-bedroom country home, complete with library, bathroom, and spacious piazza or front porch. The collection also includes handsome drawings for chimneys, eaves, window casings, interior ornamentation, and other architectural elements. A charming piece of Victorian Americana, Palliser's New Cottage Homes will be invaluable to architectural historians, preservationists, and restorers of older homes, as well as delighting admierers of authentic, turn-of-the-century architecture. Cover design by John M. Alves.